-They still believe in this guy??? Lei Feng (Chinese: 雷锋; pinyin: Léi Fēng) (December 18, 1940 – August 15, 1962) was a soldier of the People's Liberation Army in the People's Republic of China. After his death, Lei was characterised as a selfless and modest person who was devoted to the Communist Party, Chairman Mao Zedong, and the people of China. In the posthumous "Learn from Comrade Lei Feng" (向雷锋同志学习) campaign, initiated by Mao in 1963, Lei became the symbol of nationwide propaganda; the youth of the country were encouraged to follow his example. After Mao's death, Lei Feng remained a cultural icon symbolizing selflessness, modesty, and dedication; his name entered daily speech and his imagery appeared on t-shirts and memorabilia. Owing to relaxation of political controls, Lei Feng's life became more openly questioned by scholars and the public in the post-Mao era. 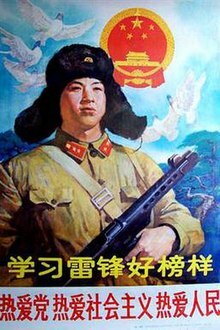 more great posters of Lei Feng at ChinesePosters.net!